aFrom the Department of Radiology, Chungnam National University Hospital, Chungnam National University School of Medicine, Daejeon, Korea. BACKGROUND AND PURPOSE: Uremic encephalopathy is a metabolic disorder in patients with renal failure. The purpose of this study was to describe the MR imaging findings of uremic encephalopathy. MATERIALS AND METHODS: This study retrospectively reviewed MR imaging findings in 10 patients with clinically proved uremic encephalopathy between May 2005 and December 2014. Parameters evaluated were lesion location and appearance; MR signal intensity of the lesions on T1WI, T2WI, and T2 fluid-attenuated inversion recovery images; the presence or absence of restricted diffusion on diffusion-weighted images and apparent diffusion coefficient maps; and the reversibility of documented signal-intensity abnormalities on follow-up MR imaging. RESULTS: MR imaging abnormalities accompanying marked elevation of serum creatinine (range, 4.3–11.7 mg/dL) were evident in the 10 patients. 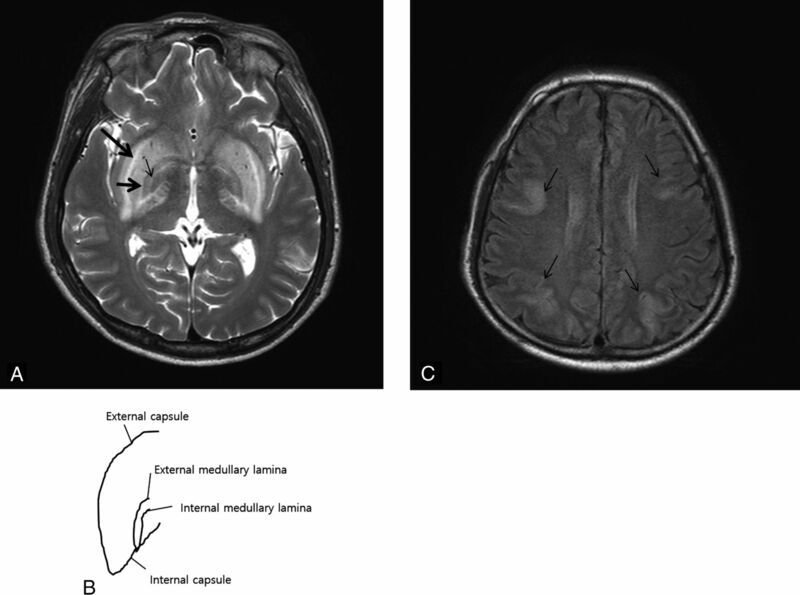 Nine patients had a history of chronic renal failure with expansile bilateral basal ganglia lesions, and 1 patient with acute renal failure had reversible largely cortical lesions. Two of 6 patients with available arterial blood gas results had metabolic acidosis. All basal ganglia lesions showed expansile high signal intensity (lentiform fork sign) on T2WI. Varied levels of restricted diffusion and a range of signal intensities on DWI were evident and were not correlated with serum Cr levels. All cortical lesions demonstrated high signal intensity on T2WI. Four patients with follow-up MR imaging after hemodialysis showed complete resolution of all lesions. CONCLUSIONS: The lentiform fork sign is reliable in the early diagnosis of uremic encephalopathy, regardless of the presence of metabolic acidosis. Cytotoxic edema and/or vasogenic edema on DWI/ADC maps may be associated with uremic encephalopathy. Uremic encephalopathy is a metabolic disorder that occurs in patients with acute or chronic renal failure. This toxic-metabolic encephalopathy is a complication resulting from endogenous uremic toxins in patients with severe renal failure. The pathogenesis is complex and unclear. Knowledge concerning a uremic encephalopathy (UE)-specific imaging feature, the so-called lentiform fork sign (LFS), is limited to case reports. The LFS may also be present in metabolic acidosis from any cause, including end-stage renal disease, methanol intoxication, and the dialysis disequilibrium syndrome.1⇓⇓⇓⇓–6 This study was undertaken to describe the MR imaging features in the brains of 10 patients with UE, with the aim of identifying common imaging features and potentially clarifying the possible pathophysiology of UE. This retrospective study was reviewed and approved by our institutional review board. The study included 10 patients (9 men and 1 woman; mean age, 58 years; age range, 17–76 years) with clinically proved UE who had abnormalities on brain imaging when examined between May 2005 and December 2014. Eleven potential patients were identified by a search of the imaging archive at our institution for patients who had the LFS on MR imaging. Imaging findings and medical records of these 11 patients were reviewed. Two of the patients were excluded because of other toxic/metabolic diseases, such as extrapontine myelinolysis. One additional patient who underwent MR imaging after a clinical diagnosis of UE was subsequently identified and included. UE diagnoses in patients were clinical and supported by laboratory findings showing deterioration of renal function and typical neurologic complications. Other possible causative conditions, such as cerebral stroke, drug-induced movement disorder, neurodegenerative disease, or other metabolic disorders7,8 were excluded by chart review. The medical records of the 10 patients were reviewed for the history and duration of diabetes mellitus (DM); hypertension; the cause of renal failure and categorization into acute renal failure (ARF) or chronic renal failure; presenting symptoms; laboratory findings (serum blood urea, nitrogen, and creatinine levels; metabolic acidosis on arterial blood gas); treatment; and recurrence. Metabolic acidosis was diagnosed on arterial blood gas if the pH was low (<7.35) and the bicarbonate levels were decreased (<24 mmol/L; normal range, 19–24 mmol/L). All patients underwent MR imaging within a few hours of the onset of symptoms. The MR imaging was performed by using a 3T scanner (Intera Achieva; Philips Healthcare, Best, the Netherlands) and a 1.5T scanner (Signa Excite; GE Healthcare, Milwaukee, Wisconsin). The protocol on the 3T scanner included T2-weighted imaging (TR/TE, 3000/80 ms; section thickness, 5 mm; section gap, 1.5 mm; FOV, 220 × 220 mm; matrix, 400 × 300; number of signals acquired, 1), FLAIR (TR/TE, 11,000/125 ms; section thickness, 5 mm; section gap, 1.5 mm; FOV, 220 × 220 mm; matrix, 316 × 242; number of signals acquired, 1), T1-weighted imaging (TR/TE, 2000/10 ms; section thickness, 5 mm; section gap, 1.5 mm; FOV, 220 × 220 mm; matrix, 260 × 166; number of signals acquired, 1), and axial 2D gradient recalled-echo imaging (TR/TE, 453/14 ms; flip angle, 20°; section thickness, 5 mm; section gap, 1.5 mm; FOV, 220 × 220 mm; matrix, 275 × 275). The protocol on the 1.5T scanner included T2-weighted imaging (TR/TE, 3600/120 ms; section thickness, 5 mm; section gap, 1.5 mm; FOV, 220 × 220 mm; matrix, 256 × 256; number of signals acquired, 2), and T1-weighted imaging (TR/TE, 450/10 ms; section thickness, 5 mm; section gap, 1.5 mm; FOV, 220 × 220 mm; matrix, 320 × 190; number of signals acquired, 2). DWI with b-values of 0 and 1000 was performed in the axial plane, by using 3 orthogonal directions of diffusion-sensitizing gradients, combined into isotropic images. Other parameters included TR/TE, 4300/46 ms; section thickness, 3 mm; section gap, 1 mm; FOV, 240 × 240 mm; matrix, 128 × 126; number of signals acquired, 1. All MR imaging data were retrospectively evaluated by 2 experienced radiologists for lesion location; appearance; MR signal intensity on T1WI, T2WI, and FLAIR images; DWI and ADC maps; the presence or absence of hemorrhage; and the reversibility of signal intensity (SI) on follow-up MR imaging. The LFS was defined as bilateral, expansile, and symmetric hyperintensity in the basal ganglia surrounded by a more hyperintense rim delineating the lentiform nucleus on T2WI. Clinical and imaging findings of UE in 10 patients are presented in the On-line Table. Nine of 10 patients had a history of underlying chronic renal failure, ranging from 3 months to 14 years. The remaining patient had ARF. Seven of 9 patients had underlying diabetic chronic renal disease (long-term DM; range, 5–30 years), and 2 of 9 patients had underlying hypertensive chronic renal disease without DM. All 9 patients with chronic renal failure regularly received hemodialysis. Seven patients had hypertension (systolic pressure range, 140–178 mm Hg), and 2 patients were normotensive on emergency department visits. The blood pressure of 1 patient was not evaluated in the outpatient clinic. All patients had acute neurologic symptoms as follows: movement disorder (n = 7), dysarthria (n = 4), and altered mental status (n = 1). All patients had uremia; blood chemistry analyses showed marked elevation of blood urea nitrogen (range, 31.7–69 mg/dL; healthy average after dialysis, 8–20 mg/dL) and Cr (range, 4.3–11.7 mg/dL; healthy average after dialysis, 0.8–1.2 mg/dL). Other serum electrolyte and glucose levels were not significantly abnormal, excluding other causes of encephalopathy. Of 5 patients with available arterial blood gas and bilateral basal ganglia lesions, 1 (patient 2) had a mild metabolic acidosis (pH, 7.31; bicarbonate, 21.7), and 4 patients had a normal pH level. One patient (patient 7) with ARF and cortical lesions on MR imaging also had mild metabolic acidosis (pH, 7.3; bicarbonate, 19.0). In 9 of 10 patients with chronic renal failure, MR imaging showed bilateral, expansile, symmetric basal ganglia lesions with increased SI on T2WI, FLAIR, and/or ADC maps, compatible with vasogenic edema (LFS, Fig 1A). Four of 9 patients showed diffuse mildly increased SI on DWI without restricted diffusion in the bilateral basal ganglia lesions, and 2 showed focal restricted diffusion, corresponding to cytotoxic edema, in the globus pallidi (Fig 2A, -B). The remaining 5 patients showed normal SI on DWI in the bilateral basal ganglia. One patient had restricted diffusion in the bilateral globus pallidus and left putamen (Fig 3A, -B). There was no significant difference among any of the patients regarding clinical findings, including serum Cr level (5.63–11.7 mg/dL in the group of 4 patients versus 4.3–10.8 mg/dL in the group of 5 patients). A 52-year-old man (patient 4) presented with seizure-like activity. A T2-weighted image (A) and diagrammatic illustration (B) show the lentiform fork sign. A bright hyperintense rim delineates the lateral (external capsule, long arrow) and medial boundaries (external medullary lamina [short arrow] and internal medullary laminae [thin arrow]) of both putamina. The globus pallidus is divided into 2 parts by the medial medullary laminae, which can be seen in pathologic conditions on MR images. A FLAIR image (C) shows multifocal relatively symmetric, gyriform high SI (arrows) in the cortex of bilateral frontal, parieto-occipital lobes and bilateral basal ganglia. A 67-year-old man (patient 5) presented with unsteadiness. 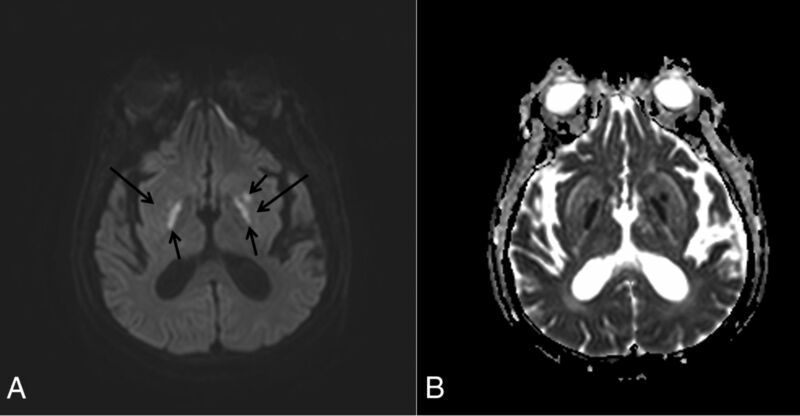 DWI (A) and an ADC map (B) show diffuse mildly increased SI (long arrows) in the whole bilateral basal ganglia lesion on DWI with focal restricted diffusion (short arrow), corresponding to cytotoxic edema in the right globus pallidus. A 70-year-old man (patient 6) presented with involuntary movement. 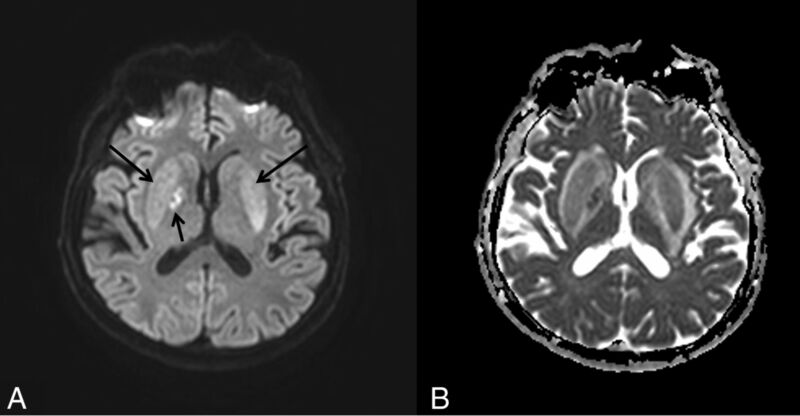 DWI (A) and an ADC map (B) show normal SI (long arrows) in the bilateral basal ganglia on DWI with restricted diffusion (short arrows) in the bilateral globus pallidus and left putamen, compatible with areas of cytotoxic edema in the lesions. Decreased SI on T1WI was noted in the lesions of 5 patients. There were no hemorrhages in the deep gray matter on T2WI or gradient recalled-echo images and no significant white matter abnormality in any patient. Two of the 10 patients (patients 4 and 7) showed cortical involvement on T2WI and FLAIR. Two patients had markedly high systolic blood pressure (systolic blood pressure, 178 mm Hg; diastolic blood pressure, 86 and 58 mm Hg, respectively) on emergency department visits. One patient (patient 4) who had hypertensive chronic renal disease showed multifocal relatively symmetric, gyriform high SI on T2WI/FLAIR images and low SI on T1WI in the bilateral frontal and parieto-occipital lobes (Fig 1C) and the bilateral basal ganglia (LFS; Fig 1A) without restricted diffusion on ADC maps. Another patient (patient 7) who had ARF demonstrated multifocal gyriform high T2 SI lesions in the bilateral frontal, parieto-occipital, and right temporal lobes and subtle nodular high T2 SI in the right putamen without restricted diffusion on ADC maps. All patients showed improvement of various neurologic symptoms, normalization of serum Cr levels, and decreased serum blood urea nitrogen levels by >60% after intensive hemodialysis. In 4 patients, follow-up MR imaging, ranging from 40 days to 3 years later, showed complete resolution of imaging abnormalities (Fig 4A, -B). A 56-year-old man (patient 3) presented with dysarthria. Initial T2WI (A) shows the lentiform fork sign in the bilateral basal ganglia. Six months later, follow-up T2WI (B) shows complete resolution of the lesions. Central-variant posterior reversible encephalopathy syndrome had been described as brain stem or basal ganglia involvement that spares the cerebral cortex and subcortical white matter.26 Imaging findings of central variant posterior reversible encephalopathy syndrome include symmetric or asymmetric vasogenic edema (the pons and basal ganglia [caudate nucleus, globus pallidus, and not resulting in the LFS]; and, rarely, the thalamus, posterior limb of the internal capsule, cerebellum, periventricular white matter) without any foci of reduced diffusivity and multiple microhemorrhages in the affected regions on susceptibility-weighted images.26 These imaging findings are substantially different from the imaging findings of UE. White matter involvement is the rarest form and occurs in the supratentorial white matter regions. This form might be considered a urea cycle disorder rather than UE. The LFS has been described on T2WI/FLAIR images as a hyperintense rim delineating the lateral (external capsule) and medial (internal capsule, internal and external medullary laminae) boundaries of both putamina, resembling a fork (Fig 1B).1 A literature review1 reported that the LFS was found in only 1 of 21 patients with UE admitted during a 10-year period in a retrospective single-institution study, without note of the absence or presence of DM. However, data from the same literature review showed that 10 of 11 patients with UE who had the LFS had diabetes, and 1 patient with diabetic ketoacidosis had the LFS, implicating diabetes in the production of these characteristic lentiform lesions. In this study, 7 of 9 patients with UE who had the LFS during a 10-year period had long-term DM. The results may indicate a higher prevalence of the LFS in Asian patients with DM and UE. Metabolic acidosis associated with disruption of the blood-brain barrier is an essential element in the generation of the LFS,1,2 and this sign may be attributable to differences in metabolic vulnerability between neurons of the basal ganglia and the astrocytes of surrounding white matter. Although UE is associated with metabolic acidosis, in this study, 1 of 5 patients with the LFS had mild metabolic acidosis, and the other 4 patients had normal pH levels on arterial blood gas. These findings are different from the results of a literature review that showed that metabolic acidosis is the basis of the LFS, and the absence of LFS might be reflective of a normal pH.1 We propose that the LFS can be seen in UE regardless of the presence of metabolic acidosis, though coexistent metabolic acidosis may exacerbate the damage of neurons in the basal ganglia. In this study, T2WI/FLAIR images showed uniform imaging findings. Diffuse vasogenic edema in the bilateral basal ganglia and/or cortical lesions represents increased interstitial fluid from a disruption of autoregulation. These results correspond well with those of the earlier studies.13,14 There was no significant difference between groups with diffuse mildly increased SI on DWI without restricted diffusion and others with normal SI on DWI in basal ganglia lesions. 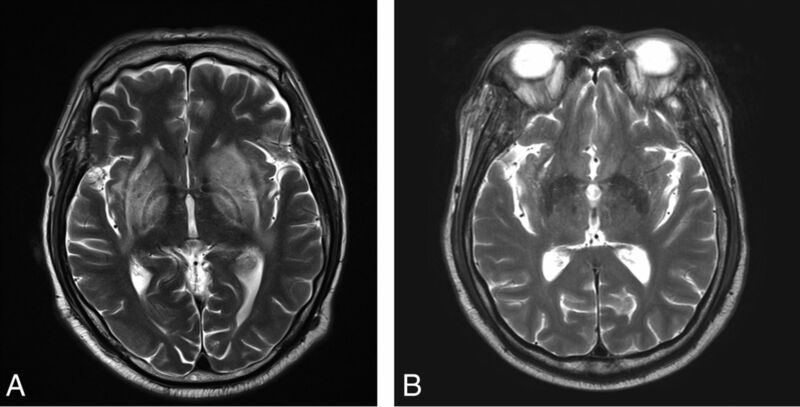 Three of 9 patients who underwent DWI showed cytotoxic edema within the vasogenic edema of the basal ganglia, and all 3 lesions had cytotoxic edema in the unilateral or bilateral globus pallidus. Thus, the globus pallidus may be more vulnerable to cytotoxic damage than the putamen in UE. The globus pallidus is thought to be a vulnerable area of toxic/metabolic injury because of its high energy requirements and resultant sensitivity to mitochondrial and nuclear dysfunction.21,27 Toxic/metabolic encephalopathy, including carbon monoxide, cyanide, cocaine, opiate, and manganese intoxication, and Wilson disease involve selective vulnerability of pallidal neurons.28⇓⇓–31 However, the vulnerability of the globus pallidus in UE has not been established, though cytotoxic edema in the globus pallidus has been described in UE.13,14 Several pathologic studies reported cytotoxic edema in posterior reversible encephalopathy syndrome associated with fibrinoid necrosis and microinfarction32 and suggested a causal relationship between cytotoxic edema and larger areas of vasogenic edema.33 However, in this study, there was no significant difference in the extent of vasogenic edema between groups with cytotoxic edema and other groups with vasogenic edema in basal ganglia lesions. Cortical or subcortical lesions of UE are predominantly found in the parieto-occipital lobes.16 Cortical lesion in patients with UE may share pathophysiologic and imaging features with posterior reversible encephalopathy syndrome. Combined clinical features (the presence of neurologic impairment, renal dysfunction, renal failure, DM, metabolic acidosis, systemic hypertension, eclampsia, pre-eclampsia, vascular disease, autoimmune disease, or cancer chemotherapy) and imaging features (the presence of bilateral basal ganglia involvement with LFS, vasogenic/cytotoxic edema in affected regions, or microhemorrhage) should be considered in the differential diagnosis of UE and posterior reversible encephalopathy syndrome. UE in renal failure is reversibly associated with hemodialysis or peritoneal dialysis, which removes neurotoxic compounds.34 In this study, all patients showed improvement of their neurologic symptoms, normalization of serum Cr levels, decreased serum blood urea nitrogen levels by more than 60%, and complete resolution of imaging abnormalities on available follow-up MR imaging after intensified hemodialysis. There are some limitations to this study. First, the sample size was small. Follow-up MR imaging was not performed in the patients who had restricted diffusion (cytotoxic edema) in their basal ganglia lesions. We cannot comment on the reversibility of these lesions. The sensitivity/specificity of the LFS for UE was not determined because of selection bias in this study. Finally, this study has not reliably demonstrated that the more severe the UE, the more likely it is to demonstrate the LFS on MR imaging, also due to selection bias. The LFS on T2WI/FLAIR imaging is important in the early diagnosis of UE, regardless of the presence of metabolic acidosis. Cytotoxic edema and/or vasogenic edema on DWI and ADC mapping may be helpful findings associated with UE. Accepted after revision February 12, 2016. Regarding "Uremic Encephalopathy: MR Imaging Findings and Clinical Correlation"